We had a lotta leftover steak recently, because we tried this recipe from the Food Network’s show, The Kitchen. It involves huge porterhouse steaks, a cast iron skillet, and a unique method. Our foodie-senses were intrigued when we saw this, and we just had to make it. It was good, but more work – and more food – than we anticipated. The instructions called for porterhouse steaks that were 2″ – 2 1/2″ thick, so of course I went for the thickest (wouldn’t you?). The butcher thought I was crazy. Turns out, he was right! And in looking at the picture above from the Food Network, there’s no way that’s a 2″ steak or bigger. We didn’t have a cast iron skillet that was big enough for both steaks, so we had to use two. Geez! Well, Gentle Reader, in this Steak Week Odyssey, the steak sandwich was the best. Sautéed onions and jalapeños enhanced the flavor of the steak, and we dressed the sandwiches with ripe red tomato, fresh mint from our herb garden, and shreds of crisp raw cabbage, serving them on onion rolls. Double-Yum! Creating this Steak Sandwich for 2 recipe more than made up for the somewhat disappointing experience of the original steak dinner. It wasn’t just tasty, it was pretty! In a medium skillet, sauté the sliced onions and jalapeños in the olive oil over medium high heat until they are soft. Season with salt and pepper and set aside. Heat the steak briefly to warm it without overcooking it; the microwave is fine for this. Try 1-2 minutes on half power. Assemble the sandwiches on warm onion rolls or other buns of your choice by starting with the steak on the bottom, adding freshly ground pepper, then the sautéed onions and jalapeños, then the tomatoes, cabbage and mint. This sandwich was delightfully easy, with a very sophisticated taste. The crunch of the fresh cabbage and brightness of the mint were the perfect compliment to the juicy earthiness of the onions and steak. Pair it with potato salad and a quick black bean salad for an easy weeknight meal whenever you’re wondering what to do with leftover steak from the weekend’s barbecuing. 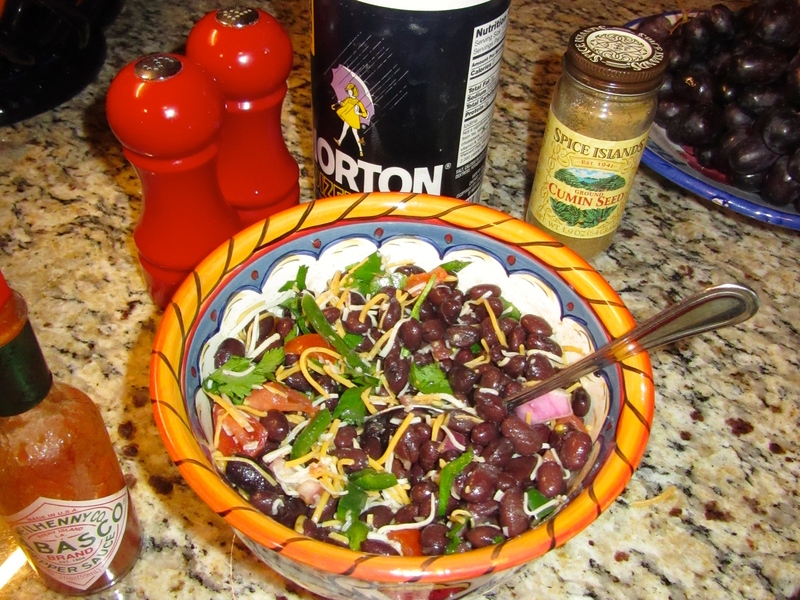 Here’s a recipe for the black bean salad. I must admit some confusion. A 2 1/2 thick steak doesn’t have to be 3 1/2 pounds. That’s about the thickness that MM starts with, but nowhere that weight. That steak frying method, btw, is Julia Child’s. Confused (or perhaps ignorant) would be a good way to describe me in this case. I asked the butcher for two 2 1/2″ porterhouse steaks. He had to go in the back and cut them. Imagine my shock when it was almost 7 lbs. of meat. I’ve never had a porterhouse before; since then I’ve researched it and seen it described as an oversized T-bone that’s a good choice for TWO people to share. And I had two. Whoops. The Food Network show gave the credit for the method to Bobby Flay (his looks better than theirs in a Bon Appetit article at https://www.bonappetit.com/recipe/perfect-porterhouse-steak), but now that I know about it, I’m interested to see Julia’s version. It was one of those recipes that felt like they left something out. I’m going to check my Julia Child cookbooks and see if I can find it. Now I see what happened. That is a lot of beef. Even 3 pounds of beef for two is a lot. I’m not sure that Julia did the cut apart approach, but the cooking and seasoning is hers which she borrowed from almost every bistro in Paris. I think we’ve been using it for years if the meat isn’t BBQed. I would have loved to see her cook against Flay. She’d have thrown him down. 🤦‍♂️🥩🥩🥩🍔🍔🍔.